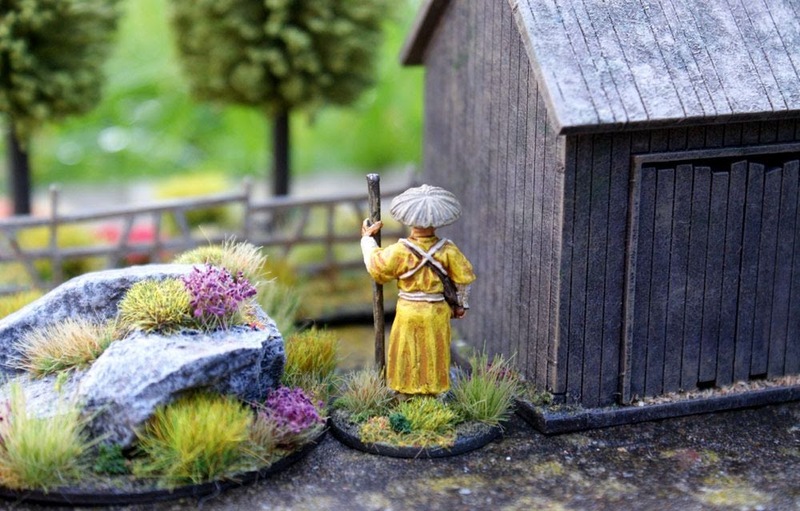 Last weekend I painted this Japanese monk for Ronin gaming. 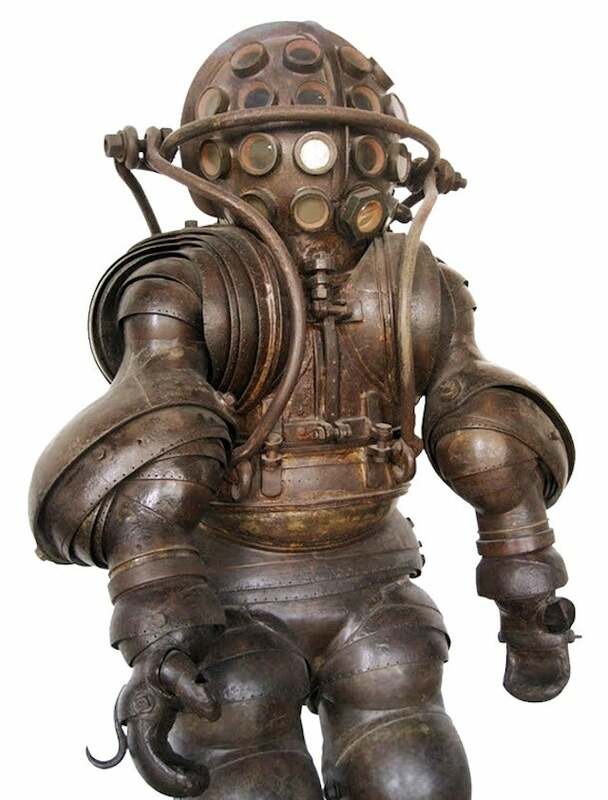 It's a 28mm-scale Perry Miniature. 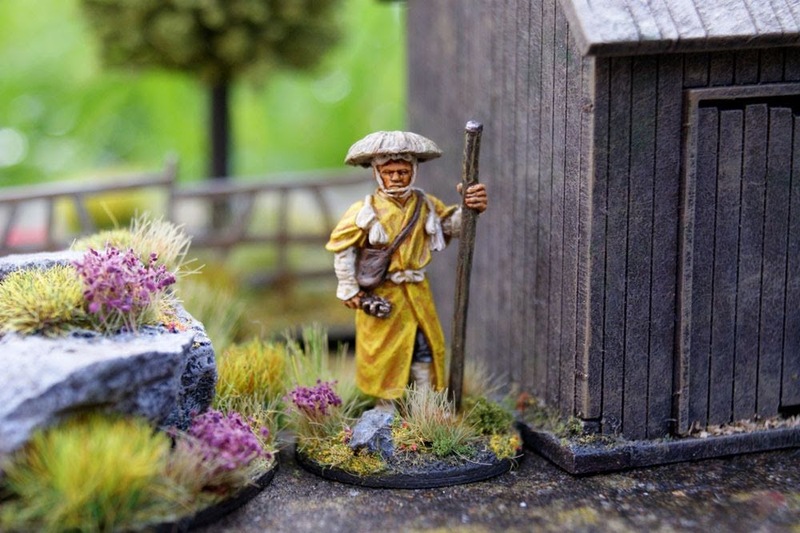 He could be used as a harmless civilian traveling monk, but I am planning mostly to use the figure as a kind-hearted warrior monk who has thrown his weight behind the local peasants in resisting the dastardly Yakuza gang. In rules terms I will tweak the Warrior Monk 'hired sword' profile to allow him to be armed only with a bo, & he would have Bojutsu & Acrobatic as Attributes, making him a skilled fighter with his innocuous staff, less hindered by difficult terrain, & even able to traverse terrain that is impassable to other figures! This weekend I started on my gaming board for Ronin (28mm scale samurai skirmish), & made some roads/tracks for it. I'd had the 2'x2' compressed chipboard ready for ages, but couldn't decide how to prepare it (PVA + sand + dry-brushing or flock? As earth or grass?). 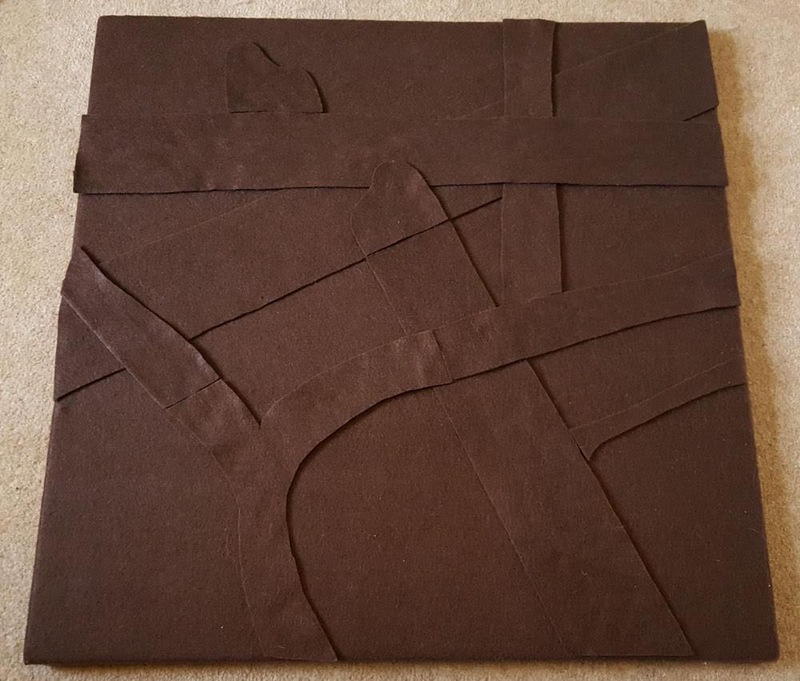 I eventually decided to get 3'x3' of dark brown felt (£3.50 from the local craft shop), & glue this neatly over the top, around the sides, overlapping the underside. This results in a nice soft basic gaming surface, with the edges of the board tidy & protected, & the underside cushioned for placing on tables. 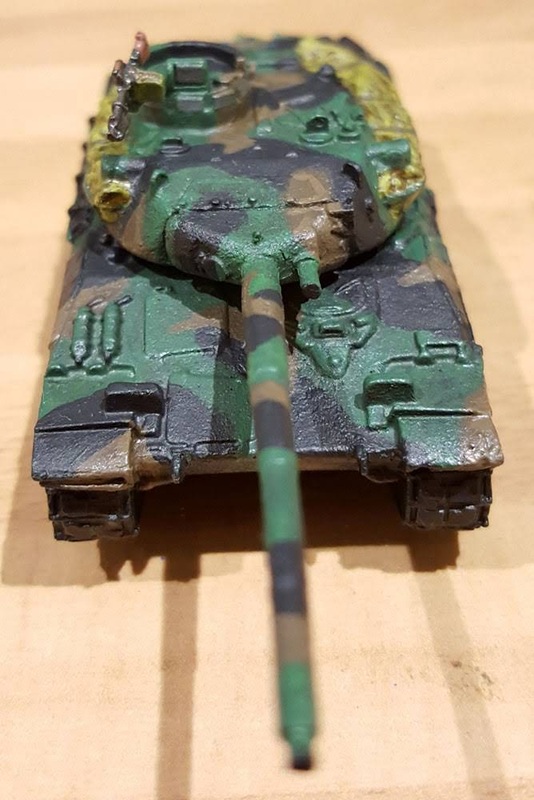 I may follow this up by dry-brushing/stippling the felt surface with a lighter brown for a more natural effect, & to blend it in with my other terrain. 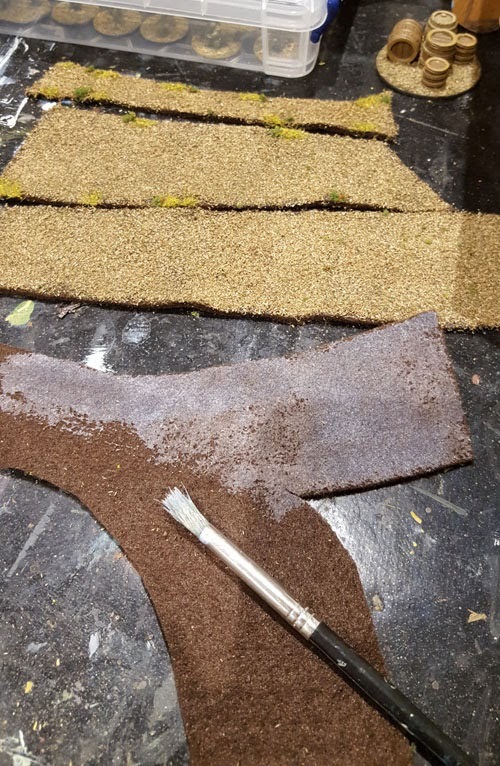 When trimming the excess material underneath the board, I had long pieces left over which gave me the idea to see if they would work as flexible roads/tracks which can conform to terrain like hills etc. 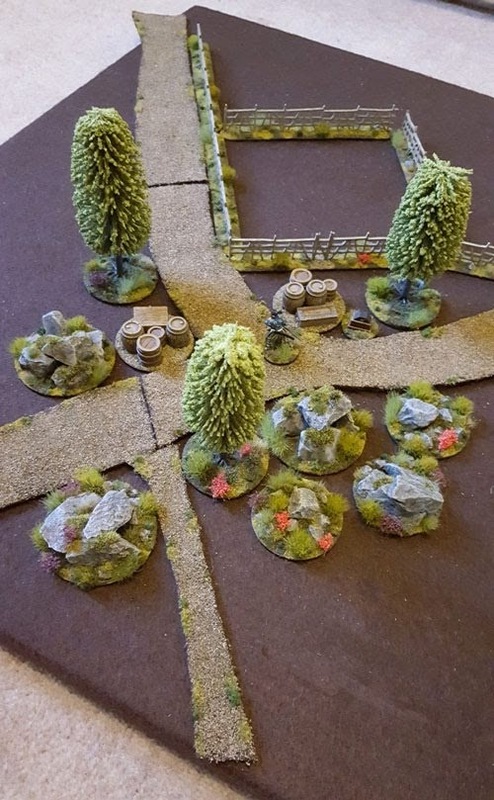 A test footpath proved that these would work much better than I expected - they were very simple to produce, & easy to press into shape on a gaming board (unlike flexible roads made of latex or canvas). I simply cut the roads to size, checking how they could be laid out on the board, & then brushed undiluted PVA glue on each in turn. I poured a custom mix of flock (1 part dark brown to 2 parts light ochre, with a tiny sprinkle of dark green 'plant' flock) over this, & pressed it down with my fingers (it adhered much more successfully than I expected). I then added a few patches of yellow-green 'grass' flock, & some small dark green 'plants' along the edges of the roads. This weekend I glued together & painted these rather nifty katana rulers for Ronin gaming. They are simple 4-piece laser-cut MDF items included in this set from Sarissa Precision. The 6" blades are divided into 1" segments, & likewise with the 3" hilts. Next, I will be painting up some Wound & Stunned markers for Ronin using Ø10mm laser-cut discs. 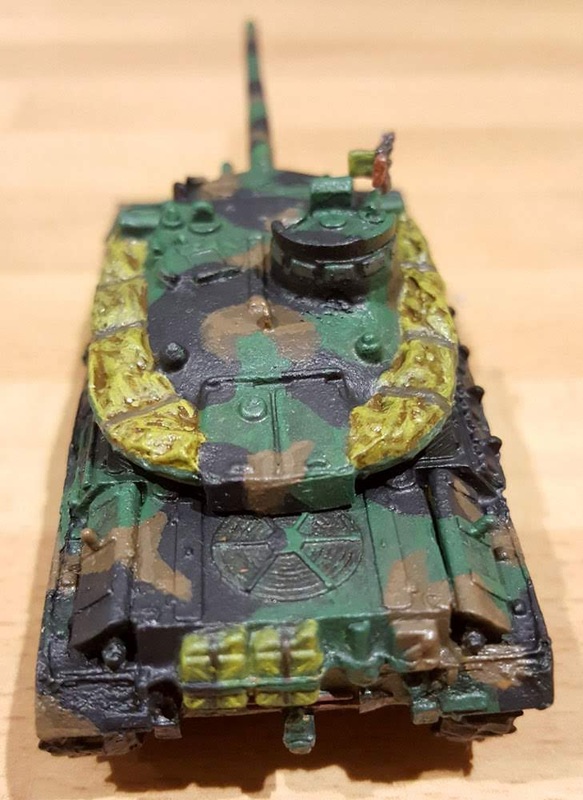 From experience of playing a few games of Crossfire now, I decided to modify how I paint ID markings for my infantry bases. 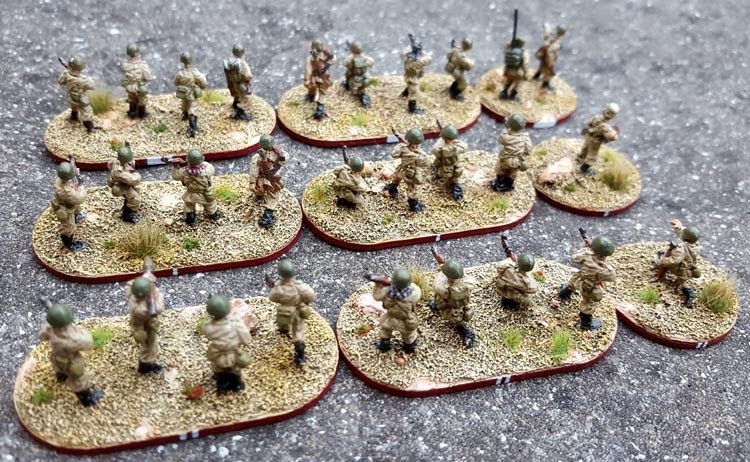 Playing with more than one platoon quickly demonstrated the difficulty in telling platoons apart (which is necessary for command structure in-game) - so I've settled on painting the edges of my bases in national flag colours to denote platoon, & using small white (or black) bars on the rear centre to denote section (squad) number. HQ section elements have a wide bar, Section 1 elements have one thin bar, Section 2 have two thin bars, etc. 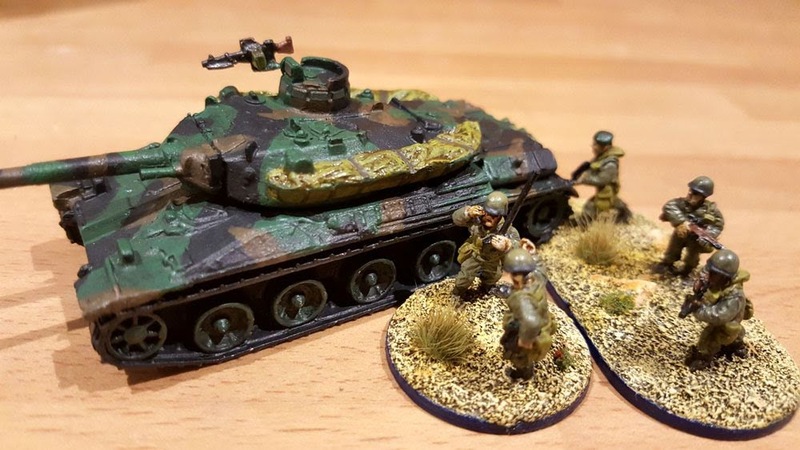 I was concerned that the coloured edges would be too intrusive visually, but at this scale, & because the players are usually looking down on the tabletop, I think that they strike a great balance between blending-in, being thematic, & being practical. 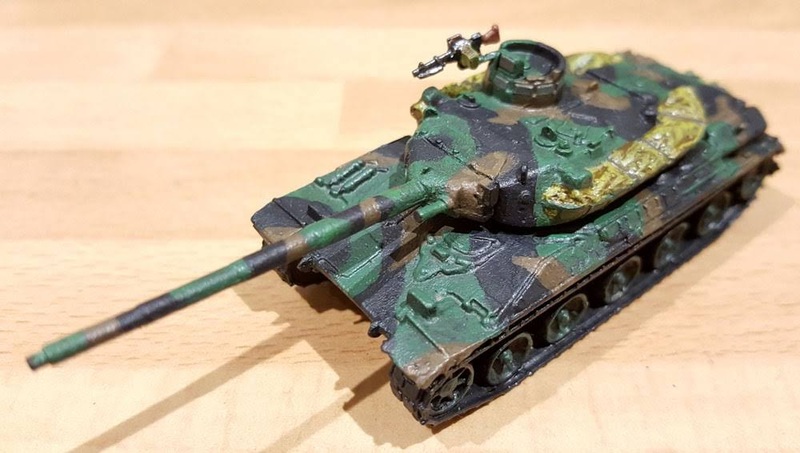 Here are two examples of this new ID scheme - on the left, my 1980s Syrian AT commandos with dark green edges, which I chose because the stars on the Syrian flag at that time were green, & these are elite fighters; & on the right is one of my Syrian mechanised infantry platoons, with red edges. 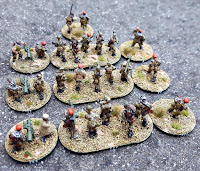 I have another mech infantry platoon under construction, which will have white edges, & the other band colour from the Syrian flag, black, will be reserved for if I add another mech infantry platoon to reach a full company. 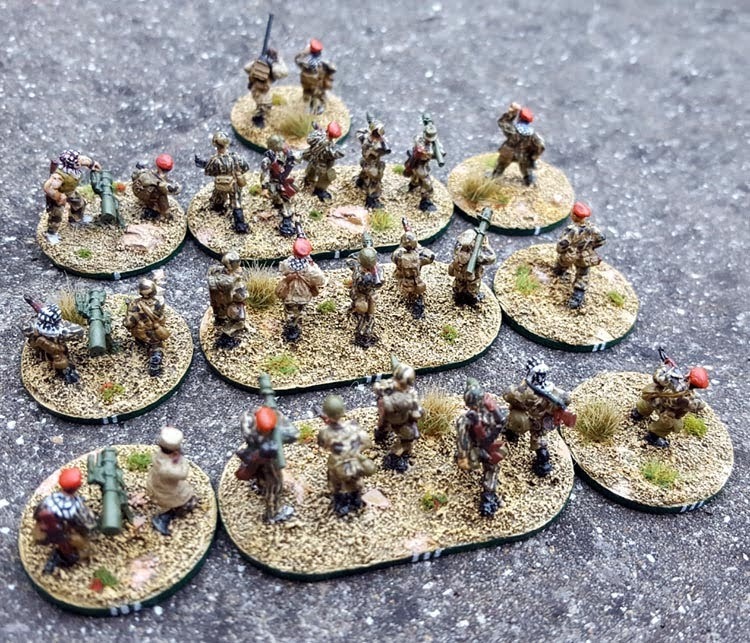 My two IDF platoons will use blue & white edges, as per the Israeli flag, whilst the two platoons of French Foreign Legion patatroopers (2e REP) that I've been painting up as an overdue gift for my friend Tim will have blue & red edges (Section Bleu et Section Rouge). 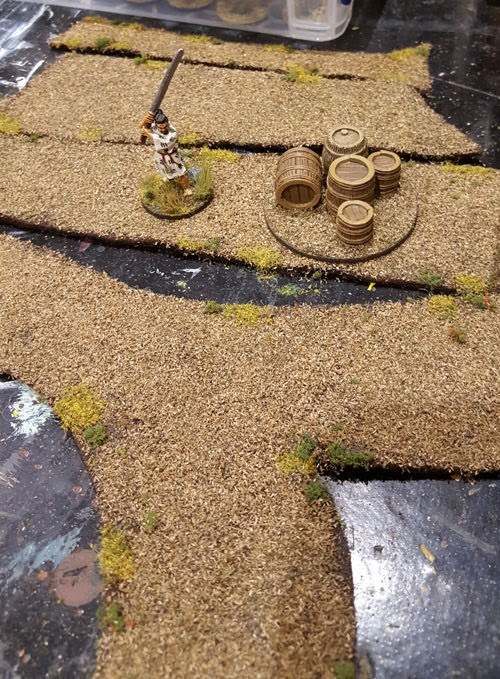 A couple more pieces of scatter terrain for Ronin & Chain of Command games - some moss-covered rocks. Same recipe as my other recent pieces: small patches of rocks, & overgrown rocks.